Winter is definately the season for home-cooking! And home-cooking smacks with Michelin quality at Chez Mamy. And leave space for dessert! 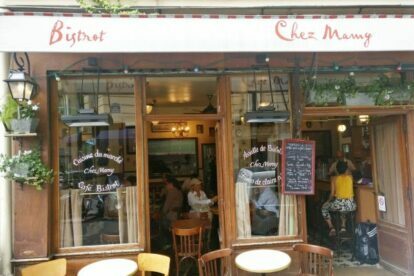 Also, Chez Mamy’s proprietor is like a ball of energy, and this sensation gets transmitted into his cafe-bistro. Serving up a warm, charming and never dull eating experience. The restaurant is just around the corner from where I live, and we tend to end up here when we’re looking for a cool buzz, warm and genuine service, and the shot of ‘Grappa’ which the owner usually enjoys making sure everyone drinks before they leave. At Chez Mamy, you’ll get the full jovial force of this French hospitality if you eat there late, say 23:00. But there’s a flip side to this energy too. Catch the place early in the morning and the aspect of the terrace catches the morning sunrays, and literally glows with the effervescence of the day. The kitchen is an open design and there’s various sized table arrangements, albeit packed in, making for an intimate vibe. The menu is seasonal and signature dishes include Tuna mi-cuit (Thai-style rare-cooked in sesame) and Pot-au-Feu (beef casserole at its best). Close to Metro Charonne or Metro Faidherbe-Chaligny.